Please sign the following urgent petitions and take as much of the suggested actions as you can to help prevent the deportation from the UK of Luqman Onikosi who faces certain death from Hepatitus if he is forced to leave the country. Please sign today Luqman Onikosi could be deported at any time. Please also write to the university of Sussex and the Home Office – details further down. 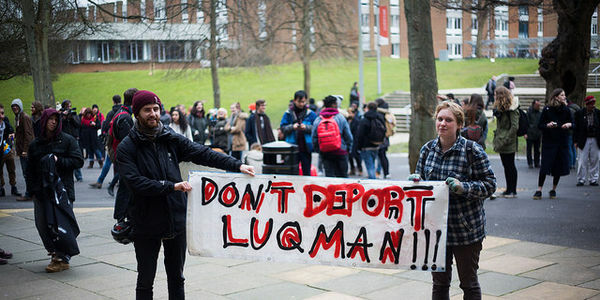 “For Luqman, who was a student at the University of Sussex, deportation is a death sentence. He is chronically ill and the medication he needs to stay alive is not available in Nigeria, where his two brothers have already died from the same disease. If he is sent home, he too will die. Luqman, who began at Sussex in 2007, was diagnosed with hepatitus B in 2009 and has since developed cirrhosis (a chronic liver condition). Due to his condition worsening, Luqman couldn’t work, lost his VISA and applied to stay on medical grounds. Whist waiting to hear of this outcome Luqman started a Masters. His second appeal to stay on the grounds of human rights was then rejected. http://www.thepetitionsite.com/118/908/799/demand-sussex-university-supports-student-luqman-onisoki-against-deportation/?z00m=27563003 – As is always the case with care2 petitions anyone from any country may sign. So please everyone sign. Stop the deportation of Luqman Onikosi! https://petition.parliament.uk/petitions/121206 – Unfortunately only British citizens or UK residents can sign this petition. Anyone from any country may of course take the actions below, so please everyone do as much as you can. Please write to Sussex University and urge them to help Luqman Onikosi, who faces deportation to Nigeria and as a consequence death from hepatitisB. Monday to Friday, 9am – 5pm. The minicom service is for members of the public with impaired hearing. Please read and watch the videos. SIRENS OF THE LAMBS was a moving sculpture by BANKSY depicting a truck full of shrieking cuddly animals being taken to the slaughterhouse. It was designated to highlight the issue of animals farmed for their meat. Banksy is an English-based graffiti artist, film director and political activist with unknown identity. The Spanish aristocrat, politician and headhunter, ESPERANZA AGUIRRE, was President of the Community of Madrid from 2003 to 2012 for the corrupt right-wing Partido Popular (People’s Party) and now is the president of that party in Madrid and spokesperson of the Municipal People Group in the City of Madrid. She was even Minister of Education and Culture. In 2013, Esperanza Aguirre wrote “Los Toros” (“The bulls”), a mediocre article in Spanish language in which she glorifies bullfighting and for which she was awarded a prize of EUR 5.000 euros. In that article she says “the bull is the most beautiful animal in the world”. That is why the bull should be tortured and slaughtered Esperanza? Also, she became the first Spanish woman to date to have been awarded an Honorary Dame Commander of the Order of the British Empire in February 2004. She, as her admired David Cameron, enjoys the bloody sport of fox hunting. The video below shows Esperanza Aguirre watching two Spanish teenagers training in the Escuela de Tauromaquia de Madrid, one of the tauromachy schools she subsided when she was President of the Community of Madrid and continues to support. 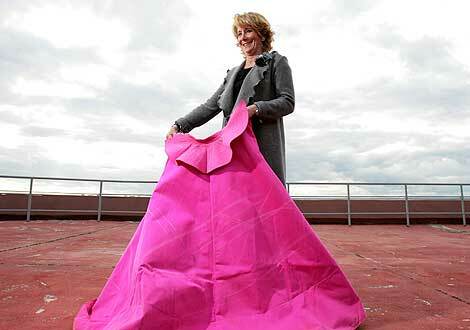 “Madrid is and will remain the world capital of bullfighting,” Aguirre wrote. And you, Esperanza, are and will remain an animal abuser. We are a step closer to the end of the welfare system in the UK as this vile government once again deals a savage blow to sick and disabled people as £30 is cut from Employment and Support Allowance ( ESA), a benefit given to disabled people in the Work Related Activity Group (WRAG) whom the government considers may be able to work at some future time. I must point out that many in this group deemed fit to work at some point are not necessarily able to do so and are in many cases seriously sick and disabled. The planned cut was delayed by peers in the House of Lords but finally and inevitably this government got it’s own way and yet another social injustice comes into being which will seriously affect the lives of people for whom day-to-day existence is already a huge struggle as the existing benefit is already inadequate. The government says that the cuts will incentivize disabled people to work! Disabled and sick people may well wish to work but are too ill to do so, incentives, or more like coercion, cannot make seriously ill people work if the are just too sick or disabled to do so. In fact charities have warned that the cut will make it more difficult for people with illness or disability to find work and many struggle to afford the basics of food, heating and shelter even on the current rate of benefit. “We’re deeply disappointed that the Government is pushing ahead with its plans despite opposition from the House of Lords and many MPs. “Half a million disabled people will be affected by this proposal – losing around £30 a week – at a time when they are already struggling to make ends meet. Cruel cuts to benefits for sick and disabled people will now go ahead, after Lords were forced to back down in their opposition to Government plans. Ministers were twice defeated by Peers over plans to slash Employment and Support Allowance (ESA) by £30 a week. The government are simply hacking away at our welfare system bit by bit until it exists no more and the progress of the last sixty or so years will be gone and forgotten. We must not allow this to happen. Make your outrage known – if you are not outraged why not????? This could happen to anyone at anytime, sickness and disability can befall us unexpectedly, no one is exempt from this possibility. If you look at the list of MPs Heidi Allen’s name is not included. This gives some small hope that even for Tory MPs there is a limit to which they will not go beyond. So it is worth writing to MPs on the list. Although this cut will only impact on new claimants, how long until we’re all re-assessed and found fit-for work? This is something I have considered myself and no doubt everyone on ESA will be thinking along the same lines. Will future assessments be rigged to make sure people are found fit for work so when they next apply for ESA they will only get it at the reduced rate. They’ve already attacked means to appeal and financial support during appeal, many of us can’t claim JSA due to severity of our disabilities, and now even if we get back on ESA we’re going to see a huge loss to our income. Just remember that £30 is a LOT of money to us…for example after paying minimum to priority bills that would leave me with ZERO for food, travel to appointments, assistive technology, etc. so how does that help me into work?! 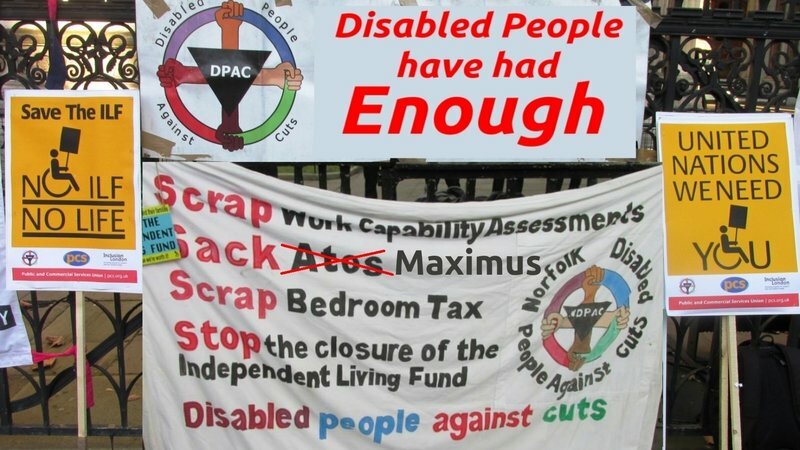 https://www.change.org/p/politicians-ian-duncan-smith-come-clean-about-cuts-affecting-disabled-people – this petition which has been round for a while needs a further 1000 signatures. International visitors please add your name to the petition, it is time this vile government is made aware of what the rest of the world think of its treatment of vulnerable people. There are more suggestions for actions you can take further down. The injustice of austerity measures to reduce the supposed deficit has fallen disproportionately on our most vulnerable citizens and it has to stop. We cannot allow this gross injustice to continue unchallenged for another four years, though even by that time it may never be challenged! We cannot accept the vile attack on sick and disabled people as part of the normal state of affairs in this country, we cannot allow the clock to be turned back to a time before the inception of the welfare state when sick and disabled people were left to the mercy of charities which however well-meaning cannot adequately provide the appropriate financial support and other requirements. There is no place in any just society for charity. Sadly the UK is not a truly just society, it never has been but it was hell of a lot better than what we have today. I would have hoped that the previous decades of progress would continue – this is surely what most reasonable people would expect . It has never been easy living on state benefits but now the situation is even more dire since Tory cut backs and punitive changes to methods of claiming. While the rich here in the UK have seen their finances rise and their tax cut, people on disability benefits have been driven to poverty as a result of vicious cuts to welfare including sanctions leaving many with no income at all. Yet who cares? Who stands up for the sick and disabled, the homeless, the unemployed and the low paid? Few it seems led astray by biased Tory led media propaganda. I would like to believe that if the majority knew the truth of the matter that they would be outraged and more willing to take action to bring about change before it is too late. Please take action and sign the following petition if you have not done so already. While it might seem futile to petition this vile man (Ian Duncan Smith) who is leading the onslaught of cuts it is time he knew that there are some of us who care, who want a fair deal for our most vulnerable citizens and who are not about to keep quiet and allow this grave social injustice to continue without at least speaking out. So please sign the above petition, it’s time that people knew the truth, the Tories are determined to destroy the welfare state, reduce sick and disabled people to poverty and destitution in order to set the clock back to a time we all thought had been consigned to history. I see a time when the welfare state will cease to exist whittled away little by little by new waves of cuts, such as the planned £12 billion benefits cut and proposed cuts of 21 billion by 2020. One poster in the graphic above asks “Where are the United Nations?” Indeed where the hell are they, what became of the bedroom tax inquiry by UN special rapporteur Raquel Rolnik on the right to adequate housing. Ms Rolnik said the bedroom tax had left poor tenants facing “hard choices between food, heating or paying the rent”, resulting in them feeling “targeted and forced to give up their neighbourhoods, their carers and their safety net.” Note: Two thirds of households hit by the Bedroom Tax include a disabled person. The findings of a UN inquiry investigating alleged violations of disabled people’s human rights in the UK as a result of welfare reforms will not be published for two years, the Guardian has learned. The UN launched its confidential investigation at aclosed hearing in London on 14 October, at which UN officials took evidence on the effects of welfare cuts from UK campaigners, lawyers and disability service users. The inquiry by the UN Committee on the Rights of Persons with Disabilities(CRPD) marks the the first time a country has been investigated by the committee over human rights breaches. Don’t hesitate to write to the UN and ask to know what is happening regarding the UN inquiries into the bedroom tax and the UK’s violations of human rights. You might not get a response but write all the same. Instead of blaming the bankers and the greedy rich whose wealth has grown while the rest of us suffer austerity, this corrupt government have targeted the most vulnerable in our society labelling them scroungers in what amounts to Nazi style propaganda against genuinely sick and disabled people whose lives are already difficult and who deserve support not condemnation, poverty and destitution. Shame on this government of millionaires which supports the rich at the expense of the poor, the sick and the disabled. Europe is a decadent continent. 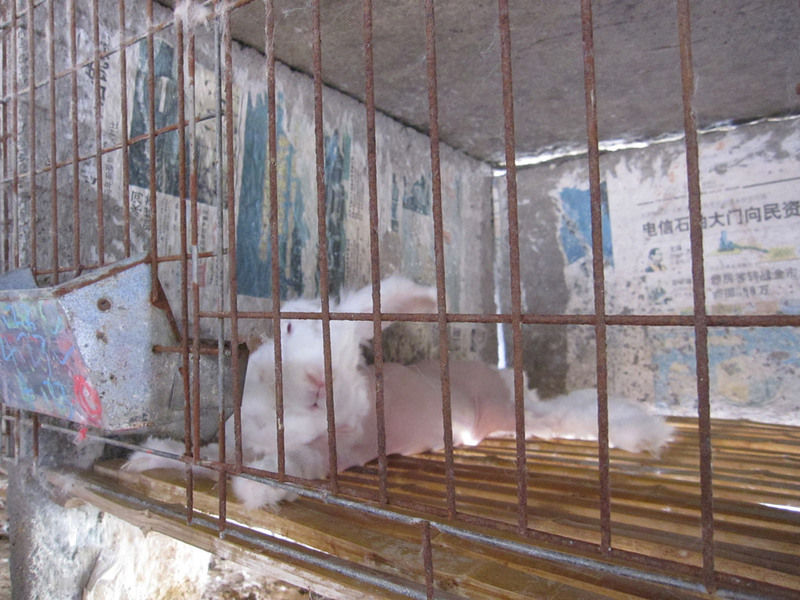 Cruelty to animals in zoos or public performances are supported by millions of citizens there. Even that cruelty receives subsidy from governments or local companies. Denmark and Spain are only two examples of decadent European countries. Animals in Danish zoos are slaughtered and dissected publicly on behalf of science, with the support of many Danes (obviously, without the support of many citizens in Denmark, those crimes wouldn’t be possible). And even though bullfighting is declining in Spain, it is still a popular spectacle that is subsidized by right-wing and some left-wing governments and promoted by the Spanish media. In some South American countries the situation is different. Performances with animals and zoos are increasingly unpopular. For example, in Uruguay. The zoo of Paysandú, in the capital of Paysandú Department in western Uruguay, has been closed down for good by decision of its Mayor, Guillermo Caraballo, after a request of the Uruguayan animal rights organization, AMIGOS DE LOS ANIMALES. The former zoo will be transformed into a botanical garden and recreational and sports space. Some of its animals will be moved to a local sanctuary and farm animals will be adopted by the Uruguayan animal rights organization, ANIMALES SIN HOGAR. More zoos will be closed down in next months in Uruguay.